At Vapour Dreams we offer a range of RDA/RBA & Tanks to suit most needs. This replacement tank is for the Aspire Atlantis. The 5ml capacity allows you to spend more time vap.. The Cleito 120 is so ground-breaking it deserves a new class of its own: “Maxi-Watt” Tank. Maxi-Watt.. 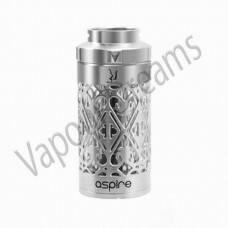 The Aspire hollowed out sleeve is the perfect replacement if you wish to customise you Aspire Triton.. The DRUGA RDA is an all new product from Augvape, don't be fooled by the price, the Druga RDA by Aug.. The Augvape Druga 22 Squonk Full Kit comes with the Druga Squonk Mod and the Druga 22mm RDA. This sq.. These genuine Kangertech replacement glass are just thing you need if you happen to break the glass .. These replacement O-Rings from Kanger are the perfect replacement for your Subtank, these come in a .. The Smok TFV8 Baby is the smaller version of the popular TFV8 Tank, this tank produces clouds of vap.. The Uwell Crown 3 Mini Tank is a direct-to-lung sub-ohm tank that features a 2ml capacity, an anti-l.. The Cascade Sub-Ohm Tank is the newest member of Vaporesso family. Features stylish look, up to 7/2m..